Throughout his 30s, Scottish novelist Robert Louis Stevenson traveled the world in search of a new home, one where the climate and lifestyle might ease the pain of the tuberculosis that had afflicted him since childhood. In 1888, he found such a treasure while visiting the islands of Samoa, and soon bought a 400-acre estate in the village of Vailima on the main island of Upolu. There he’d spend the final few years of his short life writing novels, short stories, and nonfiction collections in the humid tropics of the South Seas. As a writer, I naturally jumped at the chance to see Stevenson’s grave when, on my first full day in the Samoan capital of Apia, my host suggested driving out for a visit. Vailima was only a few miles away, and it wasn’t hard to figure out what Stevenson saw in the place. The huge two-story villa where he lived–a picturesque island dwelling with wide verandas and walls made from gorgeous native timber–sat within an expanse of lush green land, just a short walk from a dense and colorful jungle. 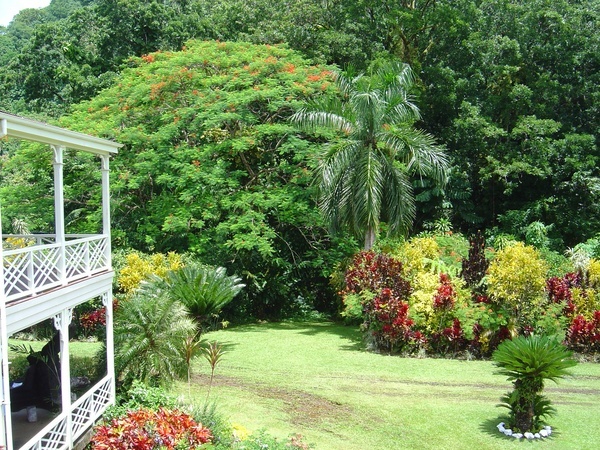 The Samoan government had used the estate for various purposes over the years before turning it into a Stevenson museum, which today is one of the nation’s most popular man-made attractions. Curators used photos taken by Stevenson as guides for restoring the interior: from a study with tapa-papered walls and woven floor mats to an upper-level medicine room where the ill writer received treatments to individual bedrooms for each of his family members that would make any city dweller jealous. No wonder Stevenson wanted his final resting place located where he’d spent the last part of his life. What my host neglected to mention earlier was that, while Stevenson was buried on the land he owned, the land he owned included one of the nation’s higher peaks. In fact, the author’s will stipulated a resting place at the very top of Mount Vaea. The hike to the top involved a steep incline up to a 1,500-foot-high peak. Which wouldn’t have been a problem if not for two things: Not knowing we’d be hiking, I was hardly dressed for the occasion, wearing jeans and sandals rather than actual shoes, and that the monsoon-like rain that overpowered the whole island the night before had left the entire trail full of wide pools of water and soupy mud that stuck like tar. Although the trail included a few areas where trampling by previous hikers had smoothed out particularly steep patches, it noticeably lacked any kind of railing to hold, and the nearest trees were just far enough out of reach to prove useless. With water collected in deep puddles throughout the way, walking in sandals made it more than a bit difficult to find a foothold, requiring more upper-body balance than a walk to a burial site should. Throughout the hike, it was impossible to ignore the fact that a team of Samoan pallbearers made the exact same trek with the added burden of hoisting the remains of a great writer in a presumably heavy wooden casket. Though, in our defense, said pallbearers most likely had dry ground to walk upon. The good news was that the top of the mountain proved worth the trip. Granted, the nominal attraction was Stevenson’s grave, topped by a white stone gently littered with island moss and inscribed with the author’s poem “Requiem” (in English and translated into Samoan), but the view was the real draw, providing an opportunity to look over the jungle canopy at the full expanse of Upolu. From there, it was possible to see the island’s villages overwhelmed by thick foliage and other peaks in the distance. I was able to survey the fantastic scenery that had been impossible to enjoy on the way up. The journey down proved a lot more hazardous than the way up, with footholds even harder to come by and the steepness of the mountain a bigger obstacle. Our group’s descent involved plenty of falling into one another like dominoes and (for a few of us) wiping out in the thick mud. Still, everyone managed to avoid falling completely down the mountainside, and some fancy acrobatics saved my camera from the damage my body sustained. The hike proved thoroughly worth it, and I know the next time I walk in Robert Louis Stevenson’s shoes, I’ll make those shoes a pair of hiking boots.